This article is in continuation with a previous post; and a part of my Kashmir Travelogue. On this particular day, we took a Gondola ride to Phase 2; and then went on the Alpather Lake trek from there. 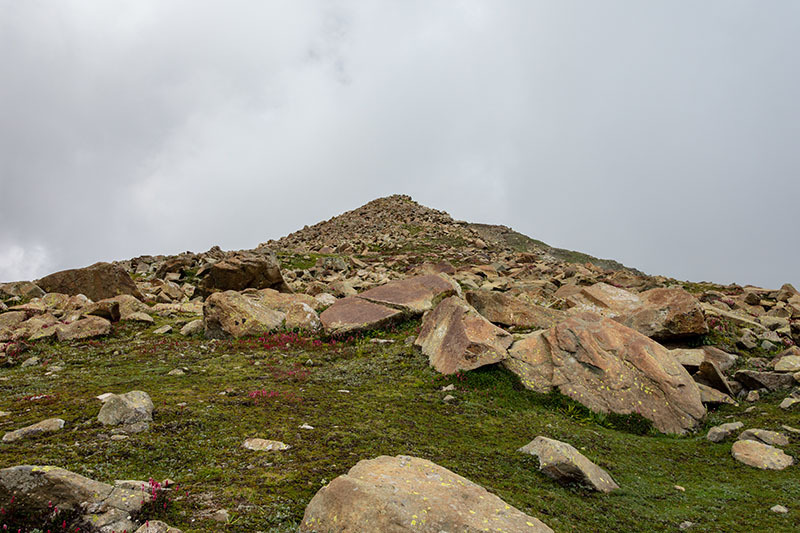 As it turned out, the short but steep walk to the lake is what we enjoyed the most during our stay in Gulmarg. It was this trek that actually made the entire Gondola ride worth it. 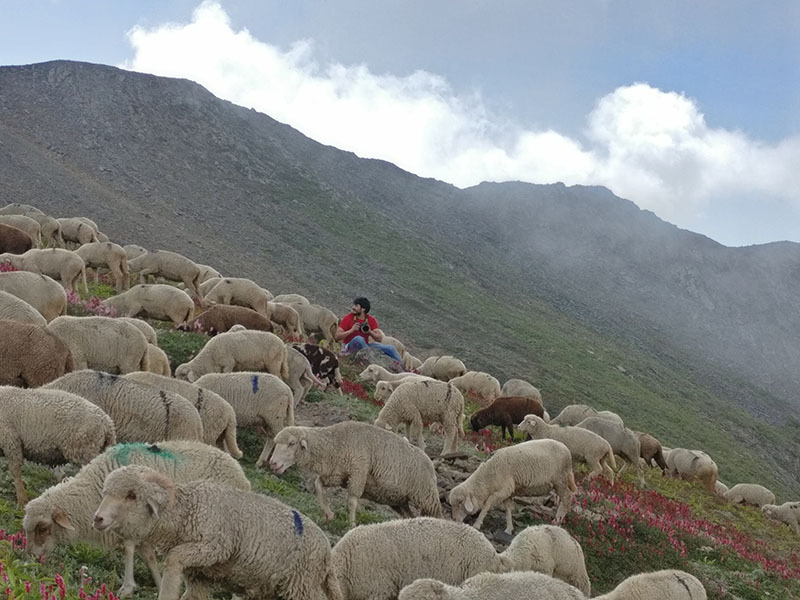 Please click on the link below to read the previous part of this travelogue detailing our ride from Gulmarg to Phase 2 Gondola Station. 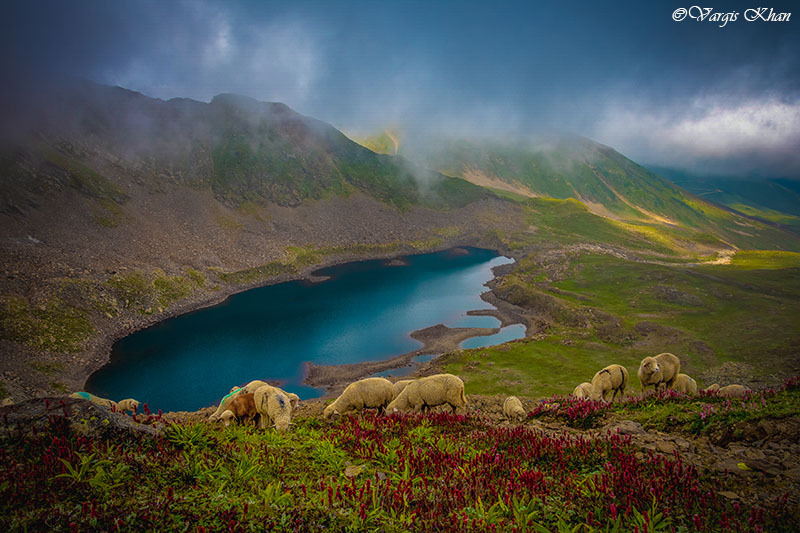 For a brief introduction, Alpather Lake is a small lake located at the top of Apharwat Peak in Gulmarg. It is commonly referred to as “Frozen Lake” by the locals; due to the fact that it remains completely frozen in winter months. 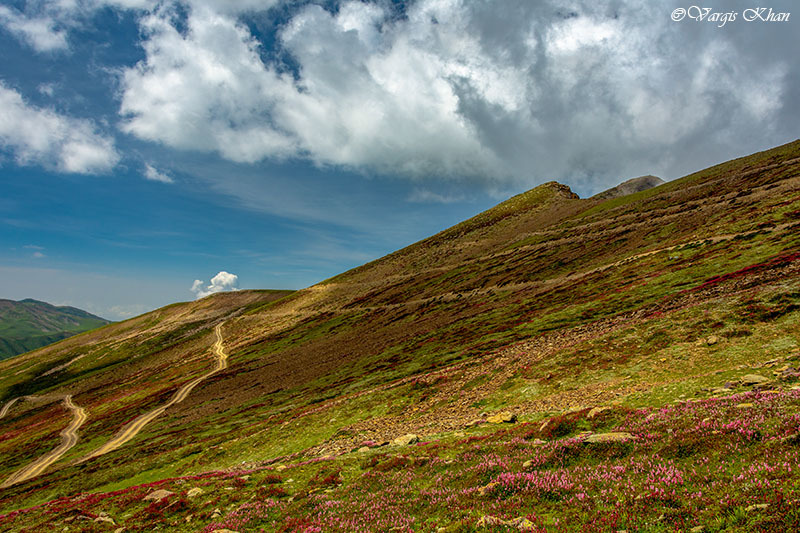 Located at a height of 4,390 meters it is a major tourist attraction in the small town of Gulmarg. 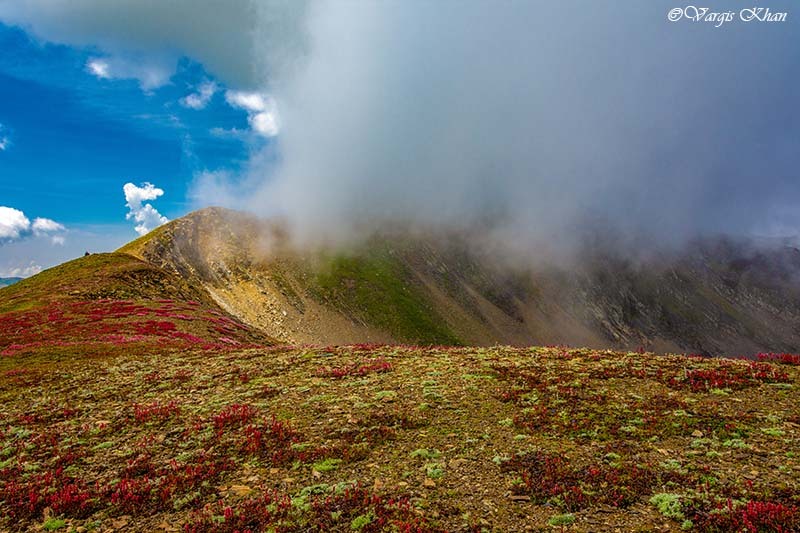 The lake is surrounded by rocky mountains, and lush green meadows that are covered with beautiful wildflowers. It is not just the lake to be honest, but the entire journey that you will take to finally get here, that is an experience in itself. 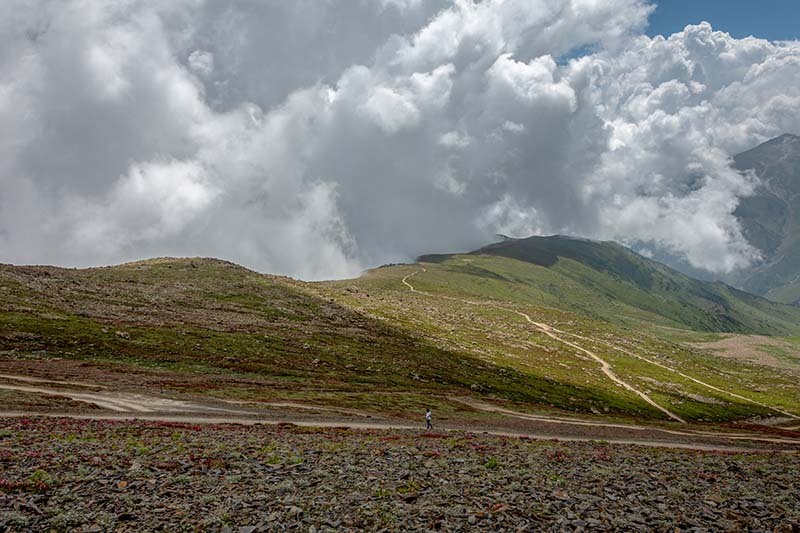 Now that we had reached the Gondola Phase 2 station, the trek to Alpather lake started. 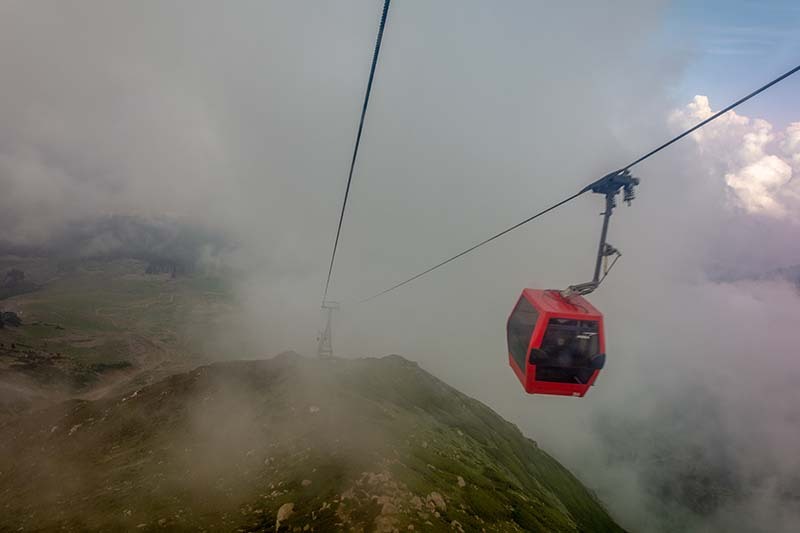 We at that time had no idea where we were headed; and the only thing we knew was that the lake is somewhere to the right of the Gondola station; and approximately 2 to 3 kilometers away. All that we could see around us were huge rocks and a steep climb, nothing else. If we were to believe the guides, then there was no way that we were going to make it to the lake on our own. But at the same time, there was also no way in hell that I was going to pay Rs. 2,500 for a guide. To be honest, I was a bit worried as well; and apprehensive about whether or not we should attempt it on our own. That is why I even agreed to pay Rs. 700 to a guide but these guys won’t budge for any less than Rs. 2500 which was a complete no for me. And I am glad that it was so because even that 700 would have been a waste if I paid. Two things bothered me at that time and both because of what the guides told me. First was that the area is too close to the border; and if we got lost up in the hills here, we may be apprehended by the Army and get in trouble. Second was the fear of dogs which as we were told by the guides are in plenty here; belonging to the Army and the local shepherds. Both were complete lies trying to trick people into hiring them. Well the border area statement was true to some extent but getting lost out here would be quite tough; unless someone really wants to wander where they aren’t supposed to. Anyways, we started on the trek on our own. To our right were numerous rocks and quite a bit of a climb. 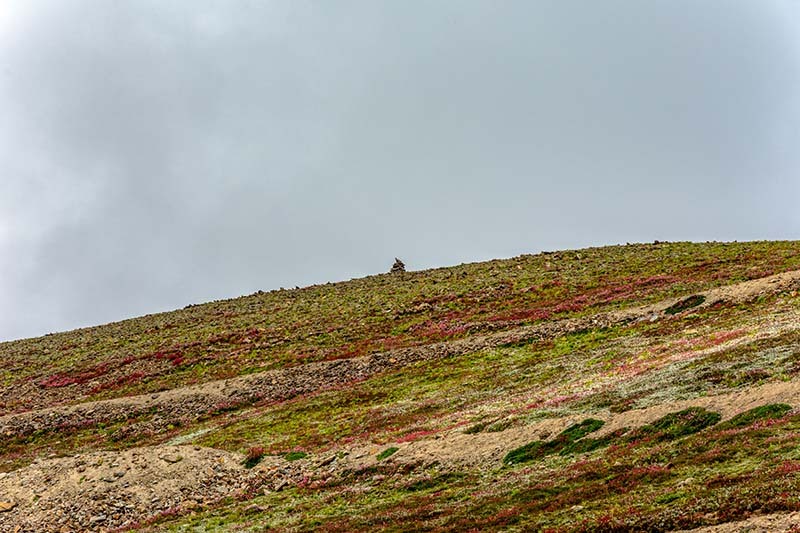 Unsure of where we needed to go, we just started walking and targeted the top of the mountain in the picture above. The idea was that once we get to that height, we will be able to spot the lake somewhere nearby. The green building in the picture below is the Gondola station. A little later, we noticed this stack of stones which I think is a Buddhist religious thing. We targeted these stones and started to climb in their direction. And surprise, surprise. We did not spot the lake but after a little bit of climbing up, what we noticed was actually a motor-able road. 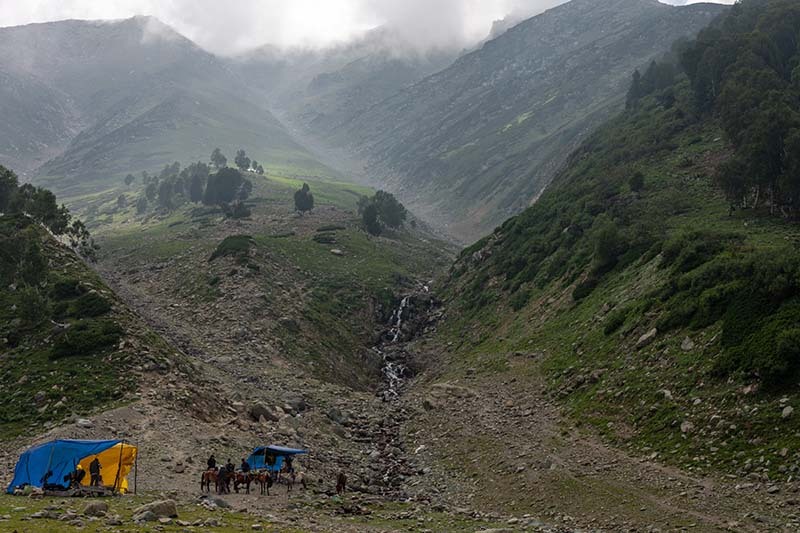 This road is actually from Gulmarg to the last few villages along the LOC. It was built by BRO and is only for Army use. Civilian vehicles are not allowed to ply on it and get stopped the moment they leave Gulmarg. Fun fact is that this road runs right next to Alpather Lake and the Army post near Phase 2 Gondola station. Now this road became our guide and we started to follow it. At one point, it bifurcated in two and we had to choose whether to go straight or up. We still kept our stash of stones as the target and continued climbing up. The lake seemed to be somewhere behind this ridge. The way the mountain formation here was, I was very sure that the lake would be somewhere here only. And I was right. We reached the top and got our first view of the lake. We then started to climb down and were met by a Shepherd and his herd of lambs. Soon we were standing next to the lake and clicking numerous pictures. A little while later a few other people arrived, some Kashmiri locals consisting of a couple of women. One of those women was an elderly lady and I was shocked to see that she too managed to climb all the way to the lake here. A little while later, an Army truck too arrived along with some soldiers. It took us well nearly two hours to walk to the lake from Gondola station. The climb was steep and distance was close 4 or 5 kilometers by road. All three of us were tired and walking back to the Gondola again seemed like a bit of a task. We finished clicking as many pictures as we could; and were about to get ready to start walking back when I noticed something really interesting. The soldiers that arrived in the truck were actually there to take a bath in the lake. Yes, you read that right. They were all taking a dip in the icy cold water of Alpather Lake. Noticing us taking the pictures, one of them walked over to us and asked if we clicked their pictures too. We said no and showed our camera. There were no pictures of the soldiers, just the lake. He went back but this gave me an idea. Rather than walking back to the lake, why not ask the soldiers to drop us back in their truck till wherever they could? We asked and they agreed; though they were a bit apprehensive initially. The condition of the road there was extremely bad. It is a very badly broken dirt trail and quite steep. Only a 4×4 vehicle can travel on it. The soldiers warned us that sitting in that truck on a road like this was going to be too bumpy a journey; and we were better walking back slowly. We were however so tired that walking was the last thing we would have opted for and jumped on the truck anyways. The soldiers were quite right though. The entire journey took us about 20 to 25 minutes but was so bumpy and uncomfortable that we had to hold on to whatever we could and hang tight to avoid injury. And even then I ended up bumping my head a couple of times and got hurt in my neck. They dropped us about a kilometers away from the Gondola station and we walked rest of the distance. Once back, we caught a Gondola back to Phase 1. Shoaib wanted to visit a waterfall at Phase 1 that one of the guides had told him about earlier. So we got out of the Gondola station and trekked another 2 to 3 kilometers, and steep again, to reach the so called waterfall. Once there, this is what we found. A complete disappointment. Waterfall ke naam par dhabba. I noticed that guides and pony owners were actually trying to trick tourists to visit this so called waterfall. They were making it sound like such a heavenly place. So word of caution, do not fall for it. This is what the waterfall is. We were here in August just after the monsoon had passed so this is all the water it ever gets. 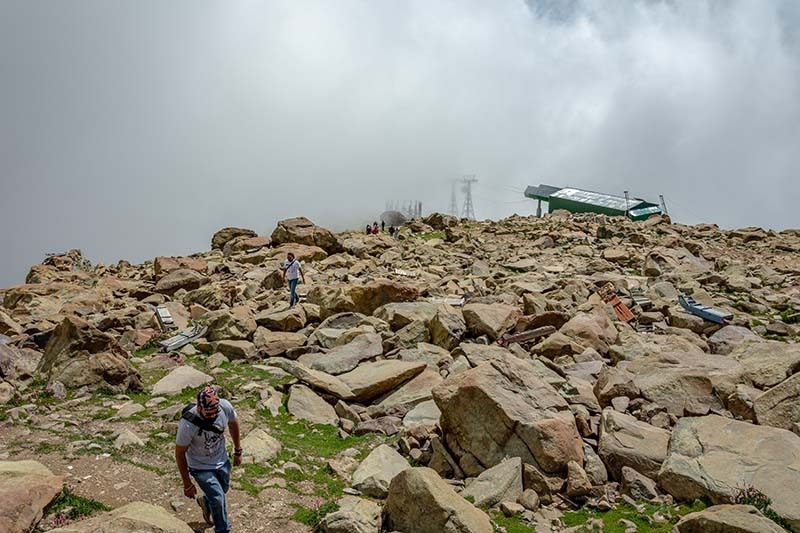 After visiting the so called waterfall, we arrived back at the Gondola station and took another lift back to Gulmarg. Shoaib and Lavish decided to go back to the hotel while I thought of another walk through the golf course and some more pictures. After a while, I too returned to the hotel and it was time to lie down and relax after a day log of walking steep climbs. After an hour or so, it was time for sunset and we came out again to get some sunset photos. Tomorrow we were going back to Srinagar so it was our last evening in Gulmarg. 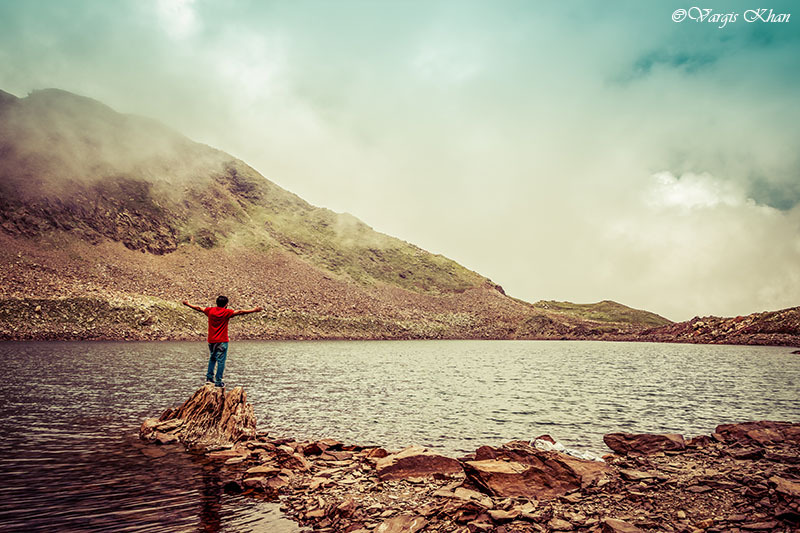 One thing that I knew for sure however was that I was definitely going to come back here for more; and possibly to see a snow covered Gulmarg next winter. Quite soon it was dark all around. We had dinner at Malik Hotel itself, owner of which was by now a good friend. A guy called Sohail runs the hotel and is great to talk to. He loves to tell tales from Kashmir if you had some time to chat. 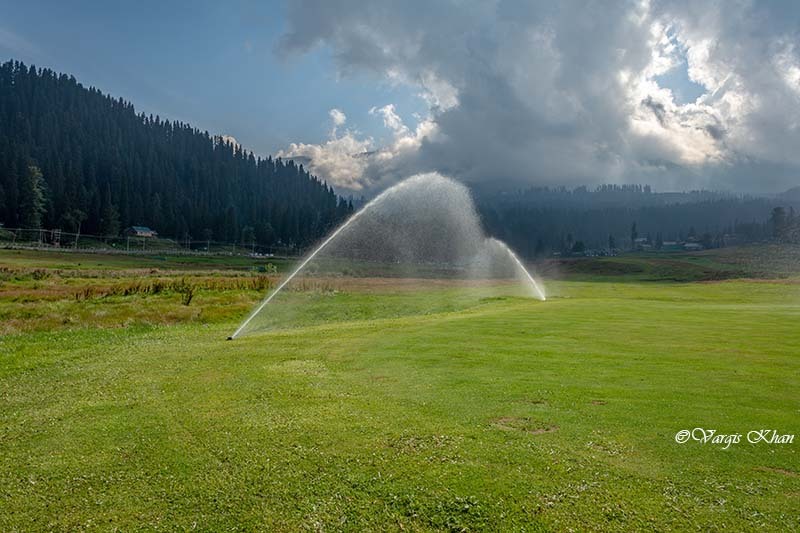 Couple of places that we still had not seen in Gulmarg were Maharaja Palace and Strawberry Valley. I figured that the Maharaja Palace was somewhere near the Maharani Temple itself but wasn’t sure which way the Strawberry valley was. S I asked Sohail about Strawberry valley and he pointed me in its direction. I asked him how far it was and if he would mind tagging along. He agreed and it was decided that we will arrive at his hotel early in the morning, possibly by 5.30 and then he would walk with us till Strawberry valley. Idea was to be back by 8 AM at most so that we had enough time to pack before our cab for Srinagar arrives at 9 AM. Once back at the hotel, it was time to watch some TV and call it a day. A day filled with plenty of fun, trekking, Gondola ride and some beautiful pictures of Gulmarg, Affarwat peak and Alpather lake. Please read Gulmarg to Doodhpathri and Srinagar to read next part of this travelogue. 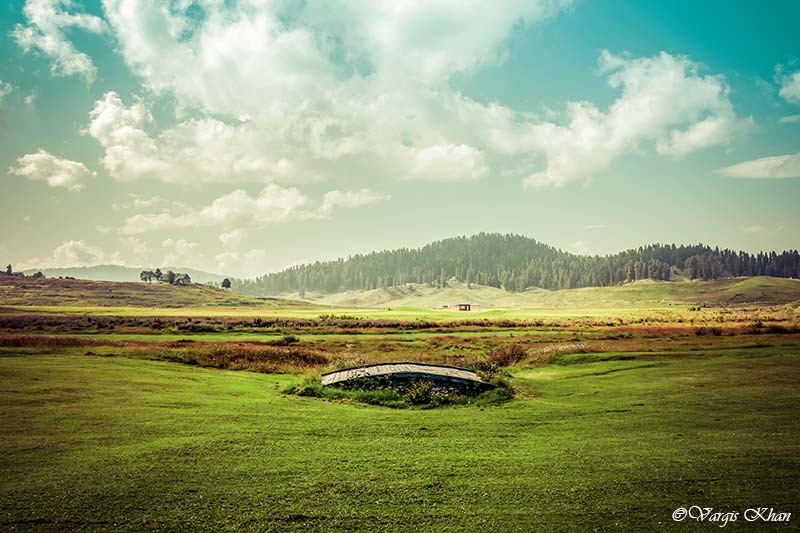 If you have any other questions about Gulmarg or places that we visited here, please feel free to ask in the comments section below; or at our Community Forum; and I will be glad to answer.